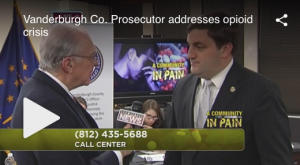 A partnership project between Vanderburgh County Prosecutor Nick Hermann and Eyewitness News WEHT called “Community in Pain” kicked off in November of 2017. The project featured an addiction phone bank staffed with experts in substance abuse treatment, and different stories which detail the disease of addiction. 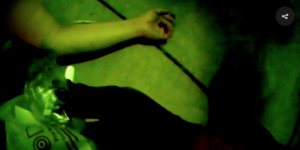 “We have a narcotics epidemic. 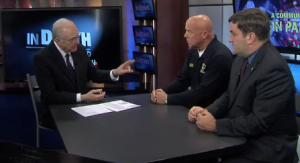 We have a heroin epidemic,” said Lt. Monty Guenin. 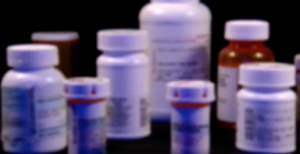 There are so many stories of opioid overdose leading to death this past year. That has prompted Eyewitness News to begin a new initiative called “A Community in Pain” where we look for some answers and solutions to this huge problem. We are partnering with several agencies to find those solutions. Eyewitness News’ Brad Byrd was live at the Vanderburgh County Central Dispatch 9-1-1 Call Center on Wednesday to speak with Vanderburgh County Prosecutor Nicholas Hermann. Evansville native Anthony Burris is serving a nine-year prison sentence at the Branchville Correctional Facility in Perry County. That’s on top of the 17 years he’s already spent locked up for various offenses. At 39, Burris said he made a promise to himself – the last time he got out of jail – to become a better person. He broke that promise just days later when a trip to the gas station for a pack of cigarettes led to a chance meeting with old friends and an old addiction. Brad Byrd talks with Tony Metcalf of the organization Churches Embracing Offenders and Vanderburgh County Prosecutor Nick Hermann about helping inmates who suffer from opioid addiction. Opioids are a problem nationwide, and right here in the Tri-State, many know how opioids can ruin lives. From selling almost every drug in the book and going to jail for it, an Evansville woman knows all too well what can happen…but she went from a dealer to healer. Eyewitness News continues its special initiative “A Community in Pain” on Wednesday. We’re partnering with the Vanderburgh County Prosecutor’s Office and the Mayor’s Substance Abuse Task Force to address the ongoing opioid crisis in the Tri-State area. Wednesday’s focus turns to people trying to recover from opioid addiction and the many programs that are there to help them. Brad Byrd talks with Donna Lilly who is a licensed clinical social worker with Deaconess Hospital and Vanderburgh County Prosecutor Nick Hermann about helping people over opioid addiction. Have you ever been prescribed pain medication by your doctor? Pills are often prescribed to fight arthritis, a broken bone, and other difficult medical issues with a long healing process. 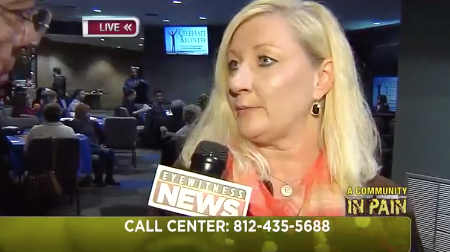 Recovering addict Whitney Herron told us that withdrawals are the worst thing she’s ever experienced in life. Like many, Whitney’s relationship with opioids started with a prescription from her doctor after being diagnosed with rheumatoid arthritis. 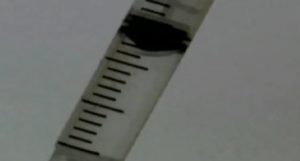 Shortly after that, her mother died from cancer – causing even more pain in her life. For one Tri-State man, it’s been a tough road. His journey into big trouble started when he was a young boy. Gary Price’s journey with drugs began and ended on the streets of Evansville. The opioid epidemic affects all aspects of society. Our initiative “A Community in Pain” is looking for answers to those problems. Brad Byrd was joined by Mellody Arrieta and Vanderburgh Co. Prosecutor Nicholas Hermann last week. On Wednesday, we took a closer look at the pain of not only those suffering from addiction but the pain shared by their families. A group called Seven Sisters is made up of seven local women who have lost loved ones to drug addiction. Kourtney Fields’ drug addiction began at age 21. He struggled with dependence to opioids for years. His family, including his sister Ally Fields, tried to intervene. But their help couldn’t match the powerful grip of opioid addiction. 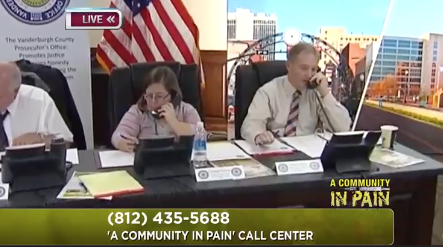 Eyewitness News continued it’s special initiative on Wednesday called “A Community in Pain.” We’re teaming with the Vanderburgh County Prosecutor’s Office and the Mayor’s Substance Abuse Task Force to address the ongoing opioid crisis in the Tri-State area. The focus on Wednesday is on where several opioid addiction cases tragically come to an end, and that is the county morgue. Brad Byrd talks with Vanderburgh County Coroner Steve Lockyear and Vanderburgh County Prosecutor Nick Hermann about the rise in opioid addiction deaths. Four months ago, Lindsey found out she was pregnant and that began to change her life. 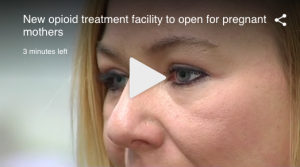 She was an opioid addict and immediately began looking for help, not only for herself but also for her unborn child. “A lot of places say they can’t medically detox you while you’re pregnant because they can’t monitor the baby, so there’s no one to help. So, I got turned down at a lot of places,” said Lindsey. But Lindsey didn’t let that stop her. She decided to face her addiction alone, battling the demons head on. The Eyewitness News initiative “A Community in Pain” continued on Wednesday. 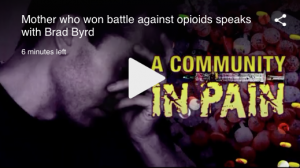 On Eyewitness News at 4, Brad Byrd spoke with a woman winning her battle against opioids. Wednesday night, Eyewitness News continued our “A Community in Pain” initiative in partnership with the Vanderburgh County Prosecutor’s Office and the Mayor’s Substance Abuse Task Force. The initiative is aimed at addressing the opioid crisis in the Tri-State. 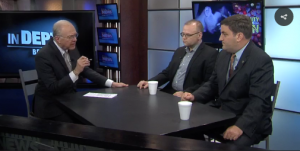 Vanderburgh County Prosecutor Nick Hermann spoke with Brad Byrd on the crisis.